10-Oct-2017 -- I’ve had my eye on this Degree Confluence Point for several years now. In years past I had scouted it out twice before while returning from Death Valley, but each time it was too late in the afternoon to hike to the point and back before dark. Today, however, I had plenty of time, because I’d stayed the previous night in Ridgecrest, and it was still morning when I started my hike. From Coso Junction, I took Sykes Road westward - continuing westward after it crossed the Los Angeles Aqueduct. At this point the road became rather sketchy and rock-strewn in places. I was barely able to continue driving it in my 4WD SUV. At 36.01526°N 117.97687°E there was a junction; I took the branch to the left, and continued until the road ended at 36.01025°N 117.98461°W. At this point I was at an elevation of 4654 feet, and 1.1 miles from the point. 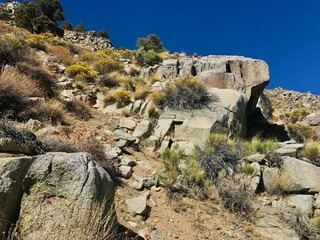 The point lies within the drainage, beside a large rock, at an elevation of 5931 feet. Steep hillsides formed the view to the north, south, and west. To the east - down the drainage - there was a clear view all the way to US highway 395 in the distance. This is quite a beautiful point, and the effort required to reach it made the visit especially satisfying.